The front desk here was amazing. If we had ideas on things we wanted to go do or restaurants we wanted to try they were super eager and willing to take care of the reservations for us. Also gave us the best recommendations for activities and local restaurants. Would definitely stay here again if I returned to Santorini. We stayed in the Boatmans house for the last bit of our honeymoon and it was amazing. The location is about a 15 minute walk from the centre so away from the hustle but the views from Ikies was unreal - and we got to enjoy it on our private balcony and jacuzzi! Eleni and the staff were beyond helpful and made us feel like home! I stayed at two different hotels in Oia. This one was a bit further from Oia's main street, but you definitely get a better sunset view here (I booked Boatman House). I loved my time looking at the sunset from the jacuzzi. The breakfast was amazing and set up for you on your patio. The air conditioning was best of all properties where we stayed. The staff were extremely helpful and accommodating. The views were spectacular. Omg everything was exceptional, except I wish the pool would have been a little bigger. The attention and service by the whole staff, especially Anna and Christina was amazing and second to none. Anna, who had lots to do with planning our activities there for a week, was largely responsible for us having an amazing trip in magical Santorini that we will never forget. I cannot day enough nice things about this place. All of the staff were so nice and willing to assist anyway they could, and very welcoming. The location was completely breathtaking. The room was amazing! They even helped us make reservations before arriving at a wonderful restaurant that we otherwise would never have known about. Seriously I could go on, but you just need for go for yourself. Great location in Oia, very friendly and helpful staff (helped with car rentals, dinner reservations, recommendations, etc. ), room service and amenities were good, wonderful views. Relative price compared to other properties near this location was excellent. The breakfast exceeded my expectations! Staff was incredible. Lock in a great price for Ikies Traditional Houses – rated 9.5 by recent guests! Ikies Traditional Houses This rating is a reflection of how the property compares to the industry standard when it comes to price, facilities and services available. It's based on a self-evaluation by the property. Use this rating to help choose your stay! Located at the very beginning of Oia, this intimate 4-star hotel provides personalized services and a wide range of accommodations, in a setting of unique natural beauty. This complex has an exceptional location with commanding views. Ikies has been recently renovated, resulting in a balance between traditional architecture and modern amenities. The houses boast post-card perfect white-washed roofs, yet each house includes modern comforts and amenities. 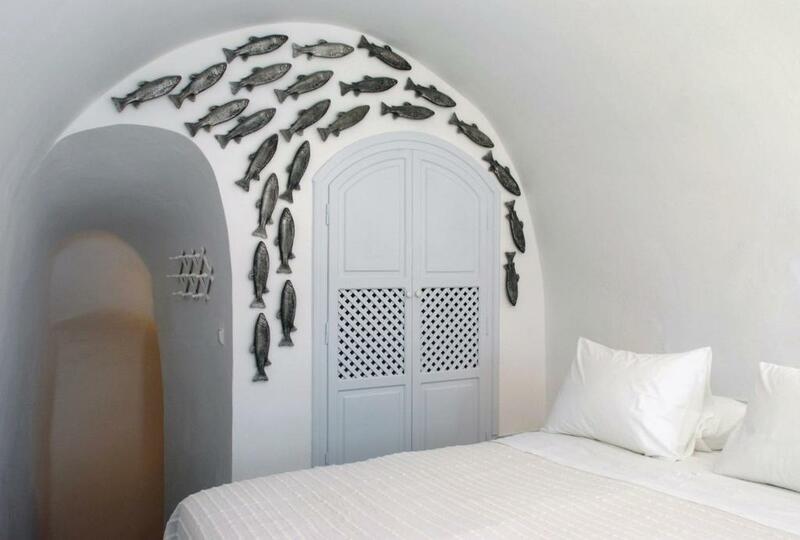 Ikies Traditional Houses provide guests with travel arrangements to and from Santorini, arrange sight-seeing tours, car rentals, scuba diving or sailing excursions. When would you like to stay at Ikies Traditional Houses? This superior studio has one main room with a queen-size bed, fully equipped kitchenette, a coffee table and bookcase, and a bathroom with a shower. It also has a hot tub. The Sailor's House is located at the pool level and has a bedroom with a queen size bed upstairs in the loft which looks down onto the living area. An extra person can be accommodated at the sofa bed. The small balcony in front of the house, where breakfast and room service are served, offers views of the village of Oia and the Caldera. The Gardener's House is located at the pool level and is our coziest and smallest room with a queen size bed, dressing table, built in wardrobe, and bathroom with a shower. It includes a sea-view balcony where breakfast and room service are served. This tastefully decorated maisonette is located on the pool level and has a bedroom with a queen size bed upstairs in the loft which looks down onto the living area. It also has a sofa bed that can be turned into a double bed, and a terrace where breakfast can be served. The Cook's House is our largest maisonette, including a bedroom with a queen-size bed and bathroom in the loft which looks down onto the living area and has a captivating view of the caldera through the loft window. It also has an extra bathroom on the ground floor, and a private balcony with panoramic views over the Caldera. The Artisan's House is our largest superior studio with one main room with a queen-size bed tucked deep in the hollow of the caldera and 2 traditional sofas which can be turned into single beds for the night in order to accommodate extra people. It also has a spacious bathroom with a vaulted ceiling and a walk-in shower. 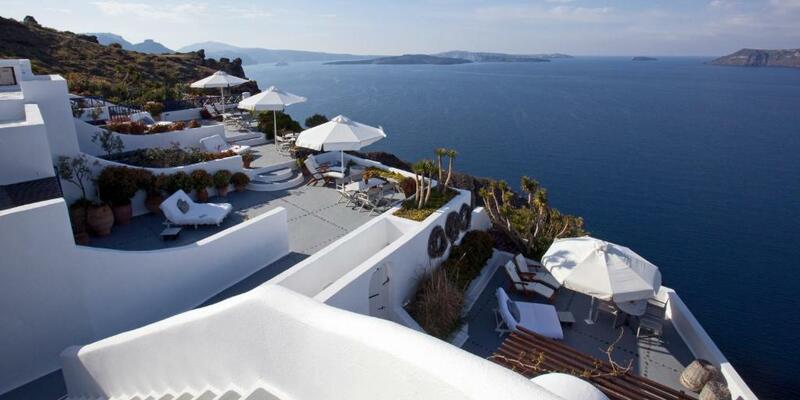 The terrace in front of the house, where breakfast and room service are served, offers views of the village of Oia and the Caldera. The Captain's House features a private hot tub nestled snugly in the corner of the secluded terrace with views to the caldera and village of Oia. The living room includes 2 sofa beds that can be turned into 2 single beds, and a dining table. House Rules Ikies Traditional Houses takes special requests – add in the next step! Children older than 13 years are welcome. Ikies Traditional Houses accepts these cards and reserves the right to temporarily hold an amount prior to arrival. Being in Ikies is like being at home. Upon arrival, you’re immediately warmly welcomed to this wonderful hotel in Oia. Eleni, Irene and the rest of the staff go way above and beyond to make your stay an unforgettable experience. Everyone was down-to-earth, friendly and always ready to lend a helping hand, be it carrying your bags to your “house” to helping you plan your adventures in sunny Santorini. When we shared a little disappointing experience we had in another town, they went out of their way to brighten our spirits. 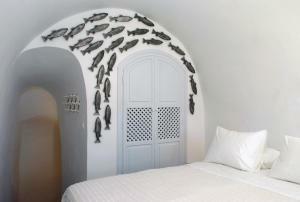 We stayed in the Fisherman’s House which was immaculate and luxuriously well appointed. Once you enter, there’s a spacious living & dining room which was great for unwinding and a very comfortable queen bed upstairs in the loft for a good night’s sleep. As all the houses, you have your own personal outdoor dining area in front where they serve a delicious breakfast each day, tailored to your choices. And the caldera view is absolutely breathtaking. 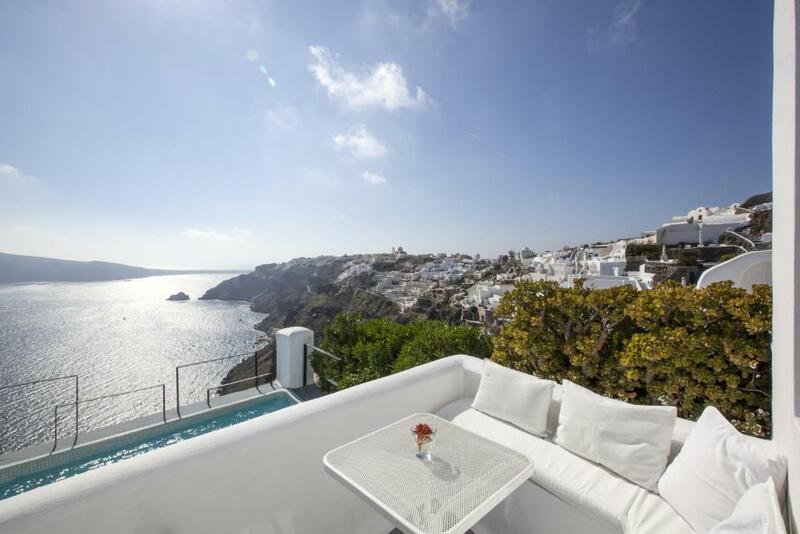 Being at the edge of Oia, you have a full panorama of this beautiful town and it’s world-famous sunset in the quiet of your own private oasis. Ikies feels so much like home that it was hard to leave this amazing haven. So much that we’re already missing it! Absolutely perfect, the best place to be in Santorini! The wifi was connection was not ok.
Nearly everything! Friendly staff, perfect location with mesmerizing views, spacious rooms, delicious breakfast ..
the view is amazing, the breakfast ia good! The property was impeccable, and the views were amazing! The staff was beyond helpful! Being over looked by a very loud family whilst trying to enjoy a peaceful romantic sunset. We have stayed in the Boatman room for a few years running and never had any issues so this was really disappointing. There are many balconies that others can see into but this usually doesn’t matter as people tend to respect each other’s privacy, then there are the very odd that don’t, think we just lucked out. The customer service is amazing, the team really do go out of their way to help you. The views are glorious, in fact the position is perfect to see the sunset from your balcony over the other white caved hotels (if not being interrupted by loud people in the Collector room above - see dislikes below). We stayed in the Boatman room, it’s one of the rooms at the top, just off reception so not a huge climb to get out to explore. The in room food was scrumptious and much cheaper than eating in at Oia! The location is perfect being walking distance into Oia but far enough away that you don’t get bombarded by the crowds. Amazing hotel Ikies! Would have loved a kettle in the room or even a coffee machine. However if you requested a coffee it was delivered promptly. Room was fabulous. Staff were all wonderful and cheery. As with all properties in Oia they come with many stairs! A bit of a walk from center of Oia, but that's why it's quiet! Would stay again without hesitation. Quiet, beautiful views, first rate! The location of the hotel was perfect. Close enough to the main part of town but far enough away from the all the tourists. The hospitality of the staff was excellent and the breakfast on the terrace was a definite highlight! Intimate. Staff predicted your needs before you asked. Breakfast amazing! !